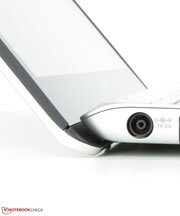 One distinctive feature of ultrabooks is their casing's maximum thickness of 21 mm. That not only makes the devices handy but also usually lets them look good. The slim casing seems to appeal to users because even conventional laptops are becoming increasingly thinner. 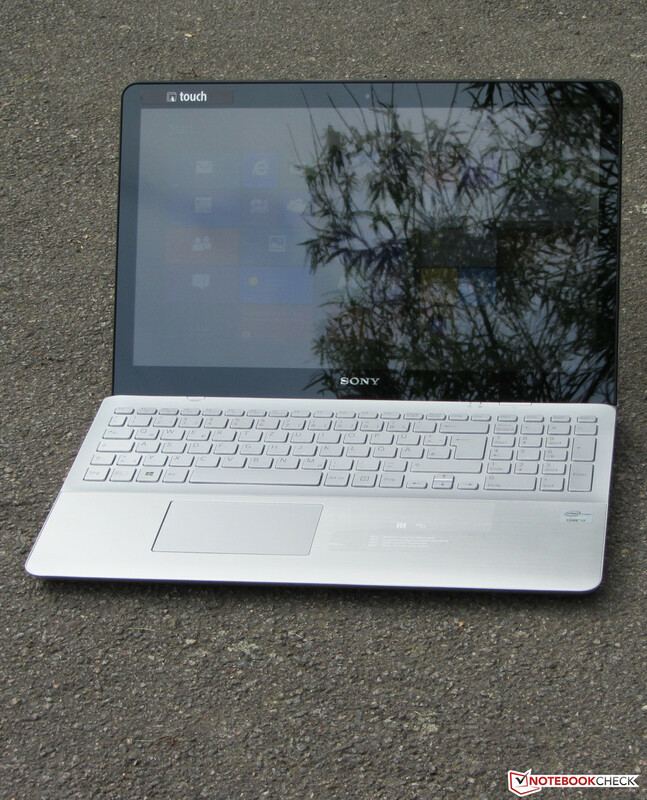 The Vaio Fit SV-F15A1S2ES, which Sony provided us with, belongs to these devices. Our test review will reveal whether the computer has more to offer than just its good looks. We used Asus' VivoBook S550CM-CJ038H (Core i5-3317U, GeForce GT 635M) and Acer's Aspire TimelineU M3-581PTG (Core i5-3337U, GeForce GT 730M) for classifying the laptop. 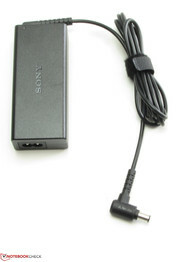 Sony relies on a 22.5 mm slim, handy and fairly lightweight casing (2.3 kg) for its Vaio SVF15A1S2ES. Apart from the display's black frame, the casing's surfaces are all matte-silver. The laptop is also available in all-over black. Sony uses a mix of materials. The lid's back and wrist rest are made of metal. The other parts are comprised of plastic. The Aspire and VivoBook are based on a similar concept. Acer and Asus both rely on a mix of metal and plastic. The base unit's stability should be better in a 1000 Euros (~$1287) computer. Applying pressure on the casing's left and right causes it to yield a bit. 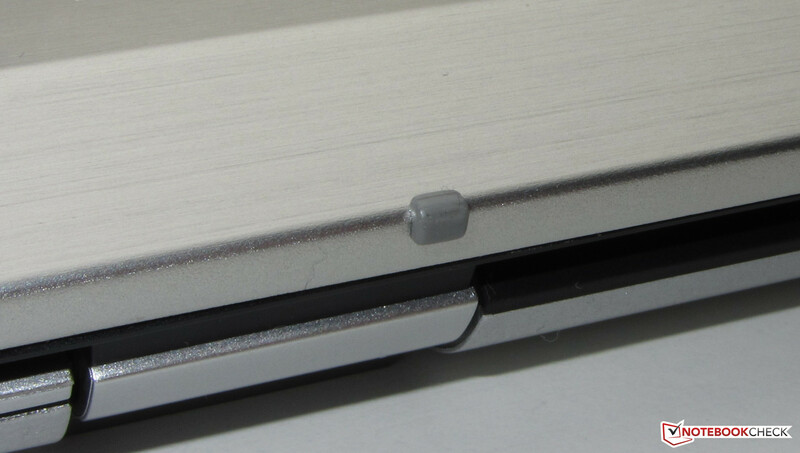 The same is true for the area below the touchpad. The stiffness is also unsatisfactory. The base unit can be warped a bit too strongly and occasionally creaks. It is possible to twist the lid without much effort despite its metal back. Also, some areas on the back can be dented to such an extent that image distortions become visible. The hinges keep the lid securely in position. Opening the lid with one hand is not possible. The lid also serves as one of the laptop's footrests. As soon as the opening angle reaches or surpasses 90 degrees, the lid makes contact with the surface and lifts the base unit's rear area. Sony attached two rubber feet on the lid's lower edge to protect it from scratching. 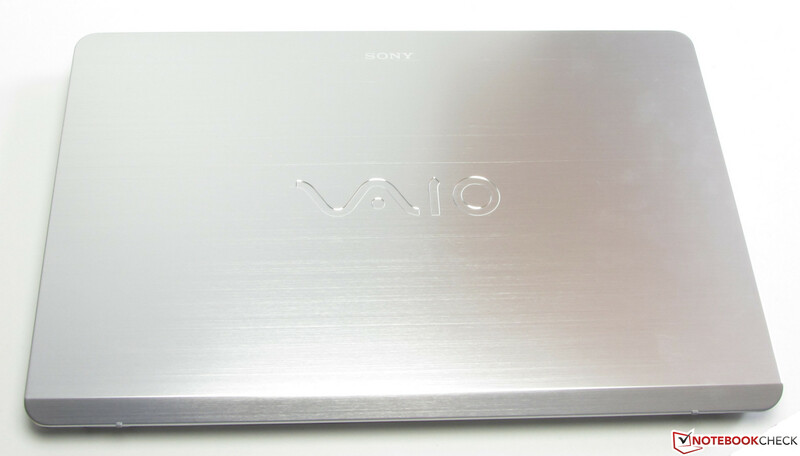 The Vaio is clad in silver. The lid's back is metal. There are no maintenance covers. The three laptops used for comparison all feature today's common interfaces. They come with at least one USB 3.0 port. The Aspire and Vaio do not sport a VGA out. Users who need such a port can fall back on an HDMI-to-VGA adapter (from 20 Euros, ~$25). Sony incorporates NFC technology (near field communication) in its Vaio. It enables wireless data sharing between two devices within a few centimeters. This technology is mainly known from cashless payments via a smartphone. Sony places all interfaces on the casing's left. Most ports are located in the rear area of this side. 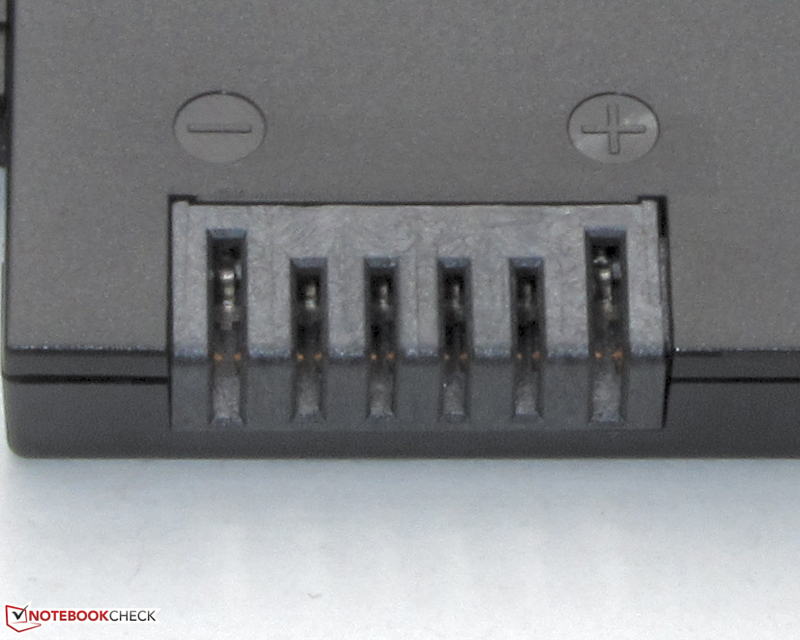 Only the memory card reader and Kensington lock slot are on the wrist rest's level. 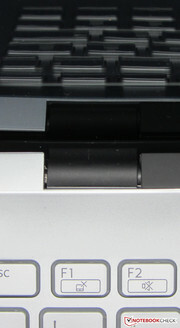 The Kensington lock's placement is unfavorable because the cable lock runs along the laptop's left and will be interfering. 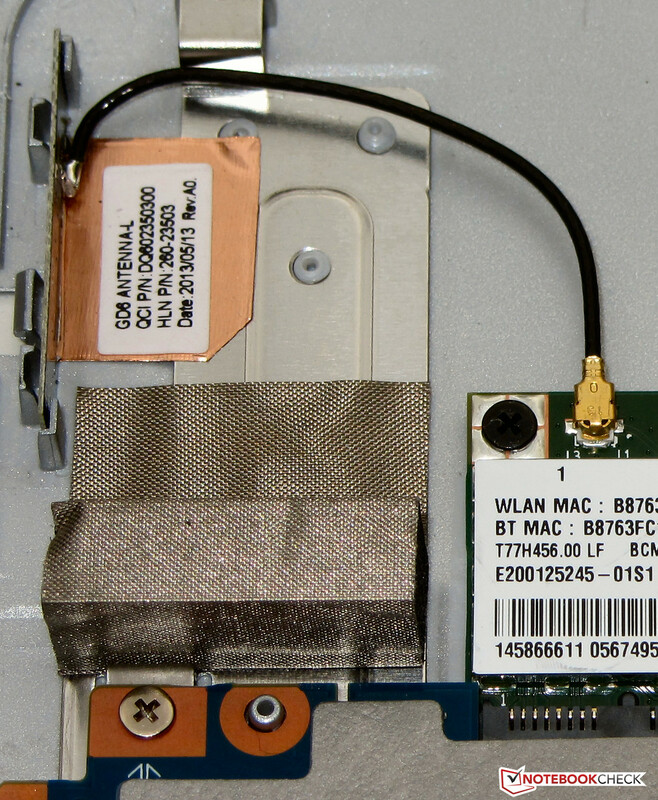 As for Wi-Fi, Sony installs a chip from Broadcom. 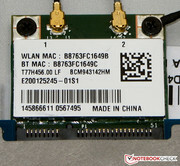 It supports the Wi-Fi 802.11 b/g/n standards. The chip also provides Bluetooth 4.0 besides Wi-Fi. The Wi-Fi signal strength fluctuated greatly. At a distance of approx. 3 meters to the router, the Windows display often only indicated 2 to 3 bars. This dropped to just one bar when moving away from the router. We think that the weak signal is due to the Wi-Fi antennas' position. They are located on both sides of the wrist rest in the base unit. As soon as the hands were placed on both sides of the wrist rest, the Wi-Fi signal's strength decreased. The signal increased when the hands were removed. 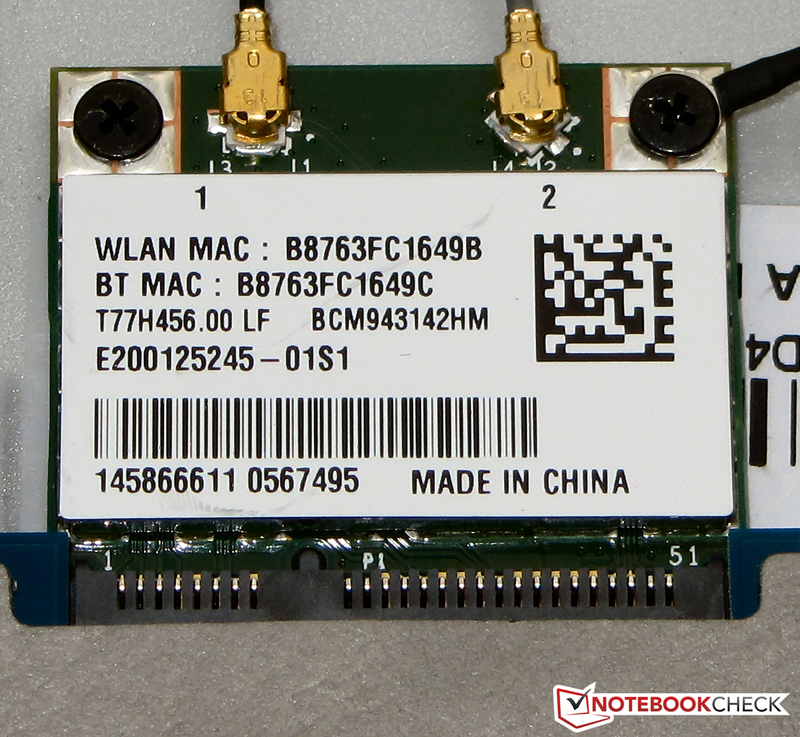 A RTL8168/8111 Gigabit Ethernet chip from Realtek can be used for cabled network connections. 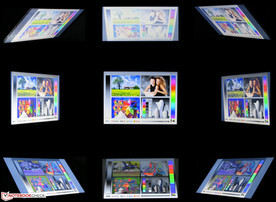 The integrated, 0.9 megapixel webcam shoots very blurry pictures with a resolution of up to 1280x720 pixels. Sony only includes a quick start poster and a few thin leaflets for the laptop. They contain safety guidelines, warranty information and a recovery manual. Sony preinstalls Windows 8 64-bit on the Vaio. An installation DVD is not included. Therefore, it is recommendable to create recovery media in order to reinstall the system after e.g. replacing the hard drive (for example, due to a defect). 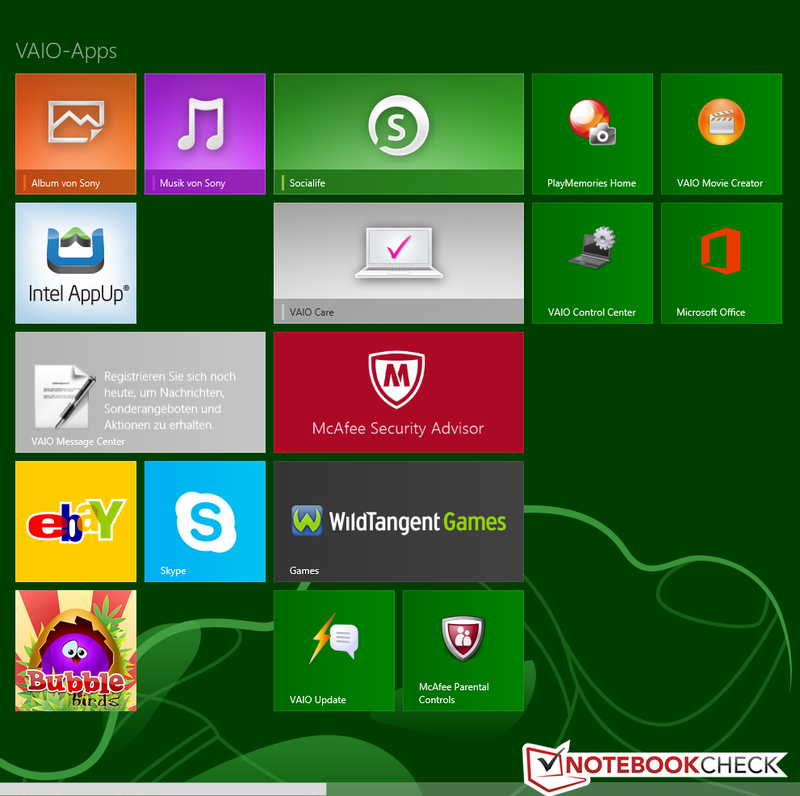 The preinstalled Vaio Care tool (desktop) provides the function for creating recovery media. Like all Windows 8 laptops, the Vaio features a recovery system. The operating system can be repaired or reset to default with it. 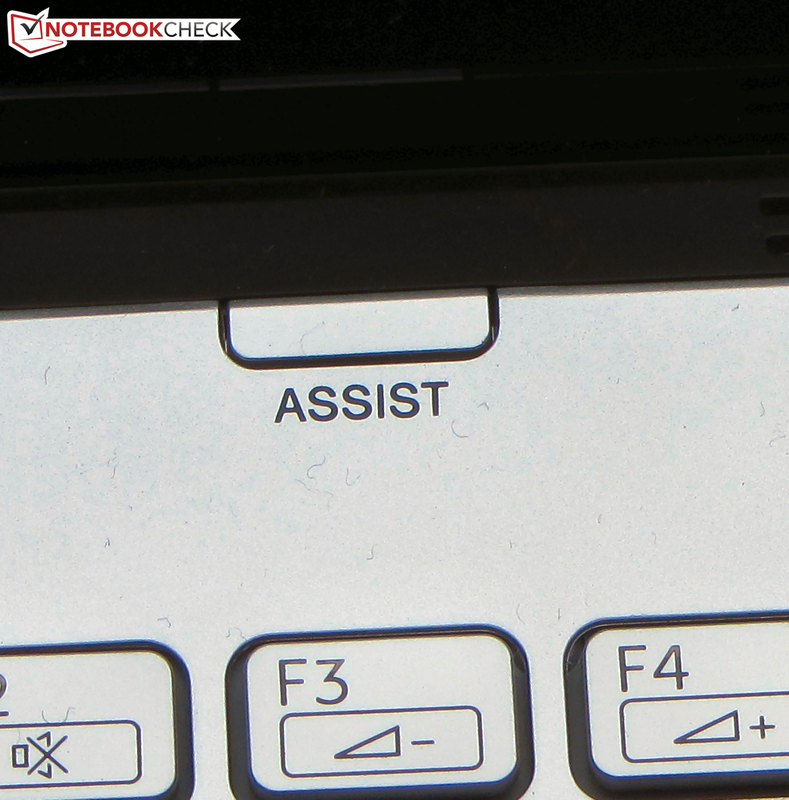 The "Assist" button has to be pressed when the laptop is off to start the recovery system. The laptop turns itself on and immediately launches the recovery system. 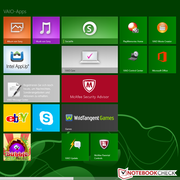 It is also possible to use Windows 7 when preferred. Sony provides drivers for Windows 7 and Windows 8 on its website. 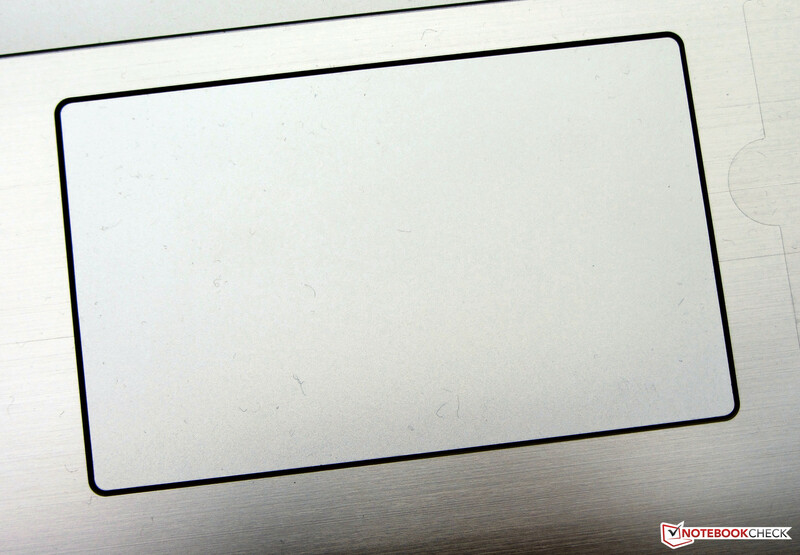 When looking at the laptop's bottom, we noticed that there is no maintenance cover. The base unit's bottom plate has to be removed for accessing the innards. However, this is no major problem. First, the DVD burner has to be taken out by removing a screw, which is roughly in the bottom's center. The DVD burner can be pulled out easily. Three flat head screws are then revealed, which also have to be removed. The same applies to all other screws on the casing's bottom. The bottom can then be carefully levered off. A putty knife from a home improvement center is recommendable for this. It is also advisable to start with the base unit's rear right area. 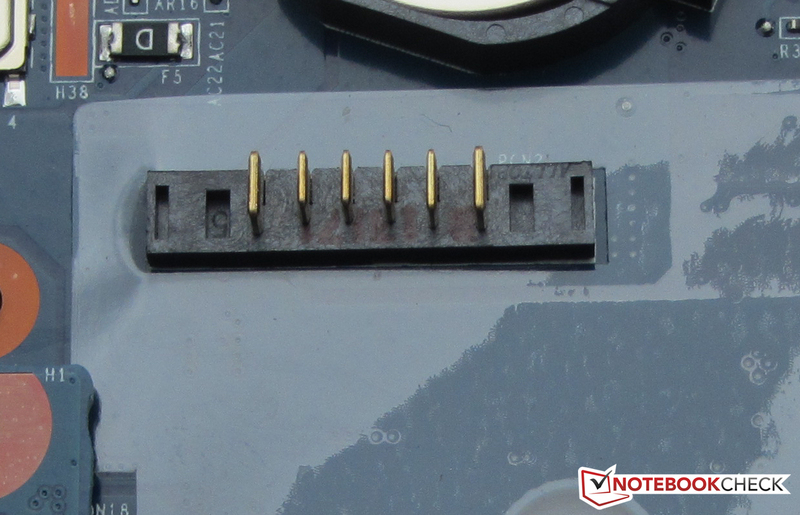 The working memory, hard drive, BIOS battery, battery, Wi-Fi module and fan are accessible after removing the bottom. The latter can be taken out for cleaning purposes. 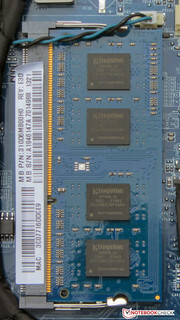 The laptop sports one working memory bank that is equipped with a 4 GB module. When the module is removed, another 4 GB of working memory is found, which is soldered to the motherboard. Replacing the hard drive is no problem either. All conventional 2.5-inch hard drives with a height of 7 mm and 9.5 mm fit in the laptop. 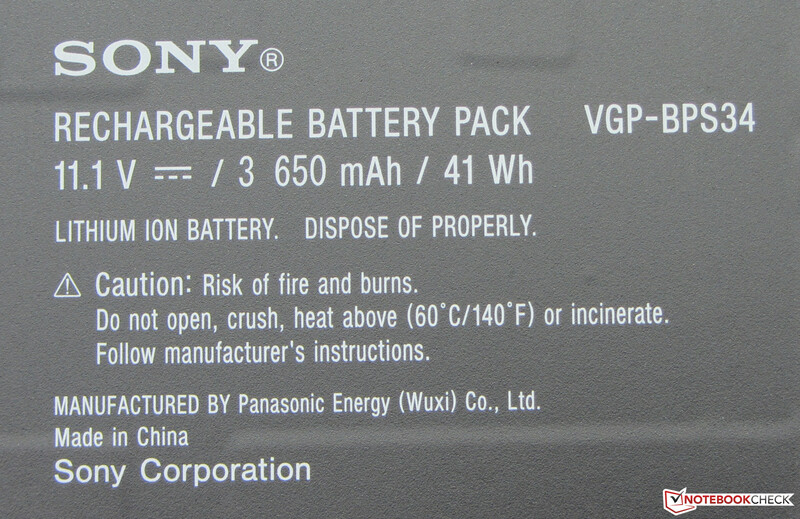 The battery could also easily be replaced in case of defect. It is secured by four screws. It is plugged to the motherboard. 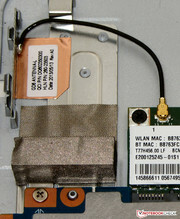 The Wi-Fi module is underneath the battery. Sony includes a 12 month warranty on the Vaio. Another twelve months are added when the laptop is registered at Sony. Both the VivoBook and Aspire come with a 24 month warranty. The Vaio's warranty can be upgraded by one or two years for roughly 90 Euros (~$115) or 130 Euros (~$167). 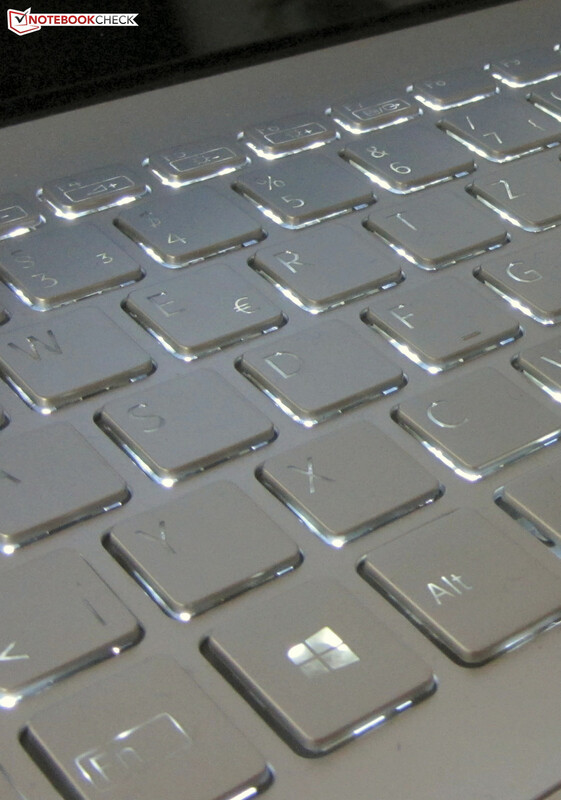 Sony installs a backlit chiclet keyboard in its Vaio. 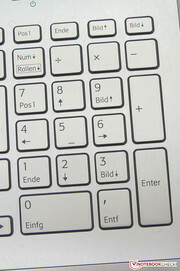 The main keys feature a size of almost 15 x 15 mm. The single keys have a short drop and a clearly palpable pressure point. The key resistance is also acceptable. The keyboard teeters a bit while typing on it, but we did not find that annoying. 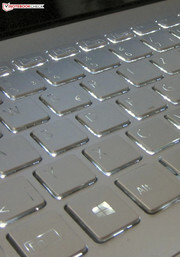 Generally, the keyboard offers the typist a pleasant typing feel. 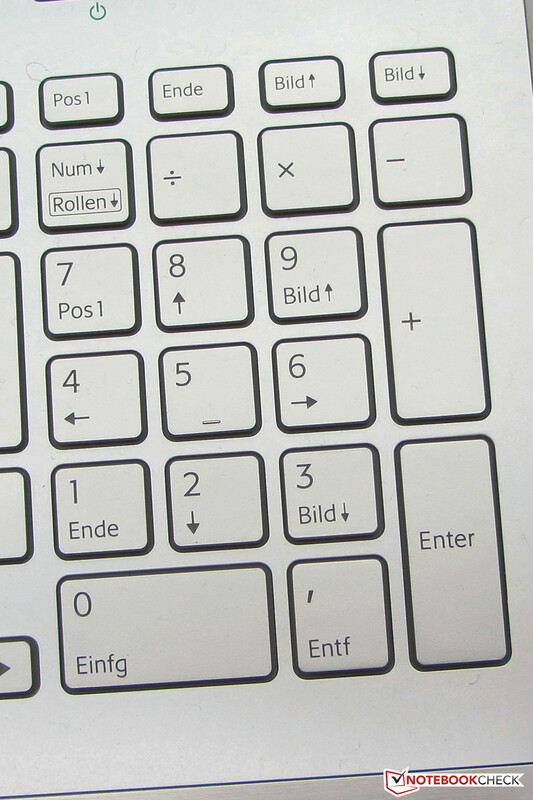 The keyboard's backlight has three levels: on, off and enabled when pressing a key. 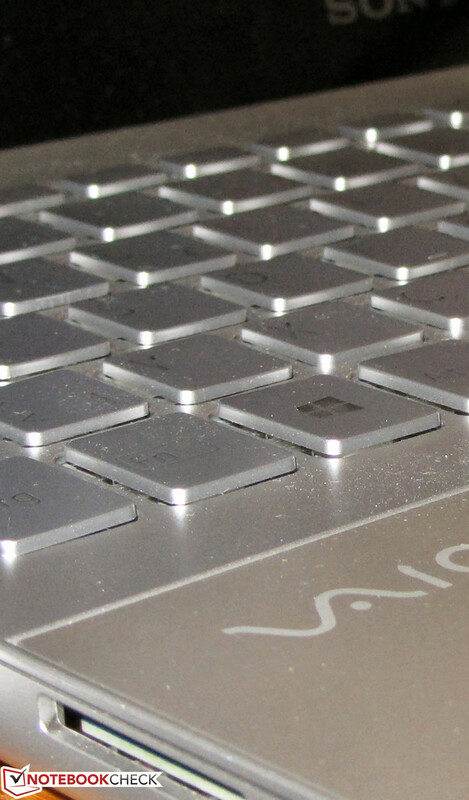 Regrettably, there is no function key for changing the brightness and the Vaio Control Center always has to be started. A multi-touch supporting ClickPad is installed as the mouse replacement. That is a touchpad that does not feature dedicated mouse keys, but the entire pad is a key. It has a size of approximately 10.5 x 6.5 cm. 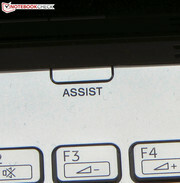 Different multi-touch gestures can be enabled or disabled individually in the pad's configuration menu. The pad's sleek surface makes gliding with the fingers convenient. However, the pad could be a bit more sensitive. It was sometimes necessary to tap with more force in order to prompt an action. The pad's configuration menu does not have an option for altering sensitivity. The pad features a short drop and a clearly audible and palpable pressure point. Another input option is the touchscreen. It responded immediately to entries and is set neither too sensitive nor too insensitive. However, the same is true for the Vaio as for all other normal laptops featuring a touchscreen. The touchscreen does not permanently allow comfortable use because the arm always has to be held in the air. In our opinion, it is more of a gimmick. Every user has to decide for themselves whether the touchscreen is useful and whether its worth the surcharge. 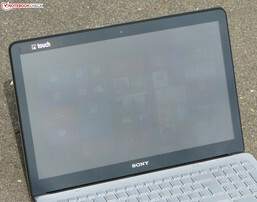 Sony relies on a glossy, 15.5-inch screen with a native resolution of 1920x1080 pixels. Both contenders only feature HD screens with 1366x768 pixels. The Vaio screen's average brightness of 269.3 cd/m² is within a good range. 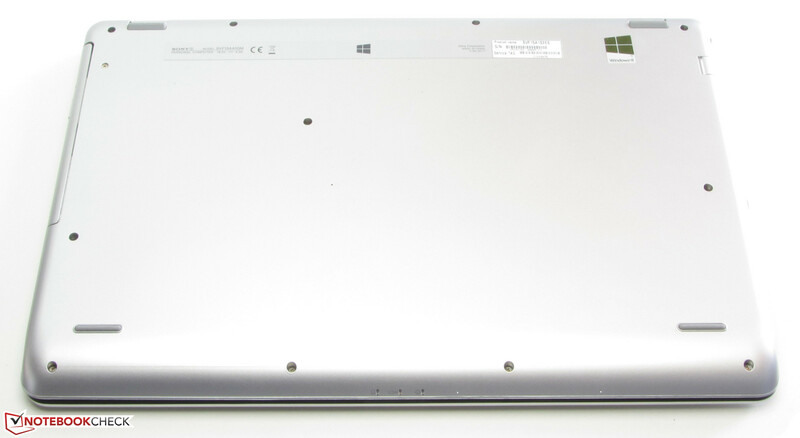 The screens in the VivoBook (198 cd/m²) and Aspire (203.1 cd/m²) cannot compete with that. However, the Vaio screen's illumination of 74% is not exceptionally good. The contenders do a better job here (VivoBook: 83%; Aspire: 86%). The screen's contrast of 509:1 and black value of 0.55 cd/m² are also within an acceptable range. The screen in the VivoBook (170:1; 1.26 cd/m²) lags far behind these rates. The Aspire's screen (495:1; 0.42 cd/m²) is on a par with the Vaio's screen. The Vaio's screen cannot reproduce the AdobeRGB or sRGB color spectrum. We assessed the screen in its default state (target color space: sRGB). 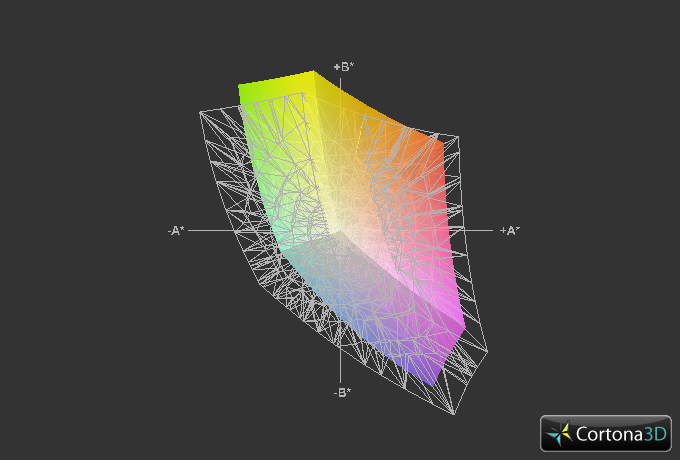 The DeltaE 2000 deviation of most colors is below the rate of 10. A few also achieve the target range of DeltaE smaller than 5. The screen has an evident bluish cast. The screen's brightness would basically suffice for outdoor use. However, the glare-type surface prevents any such intentions. A shady place is a must when the laptop is to be used outdoors. The viewing angle stability is not much better than we know from much lower priced laptops. Changing the vertical angle quickly leads to image distortions. It looks better horizontally; the content can still be recognized from the side although the image dims with an increasing angle. 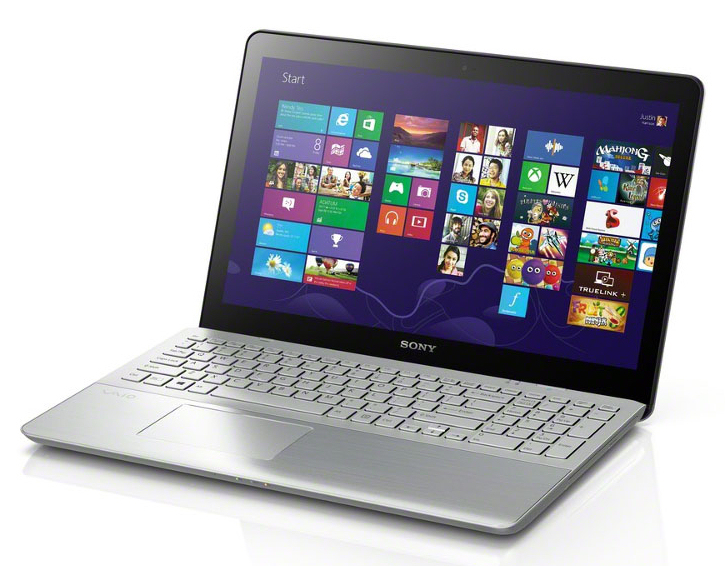 With the Vaio Fit SVF15A1S2ES, Sony offers a slim all-round laptop in a 15.5-inch size. Routine tasks, such as internet communication, office tasks or rendering videos, are no big challenge for the laptop. The GeForce graphics core also allows playing up to date 3D games. Video editing is also fun due to the high definition screen. Sony includes the corresponding software (Movie Studio Platinum 12) on the device. Our review sample's current price ranges from 1000 Euros and 1100 Euros (~$1287 and ~$1416). 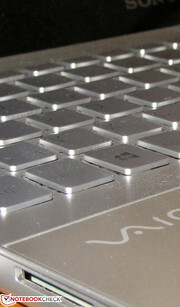 At the time of writing, other configurations of the Vaio were available. For example, approximately 100 Euros (~$128) more was demanded for the top model with a Blu-ray burner and a larger, 1 terabyte hard drive. Users who are satisfied with a Core i5-3337U processor can save about 100 Euros (~$128). The laptops are available in both silver and black. 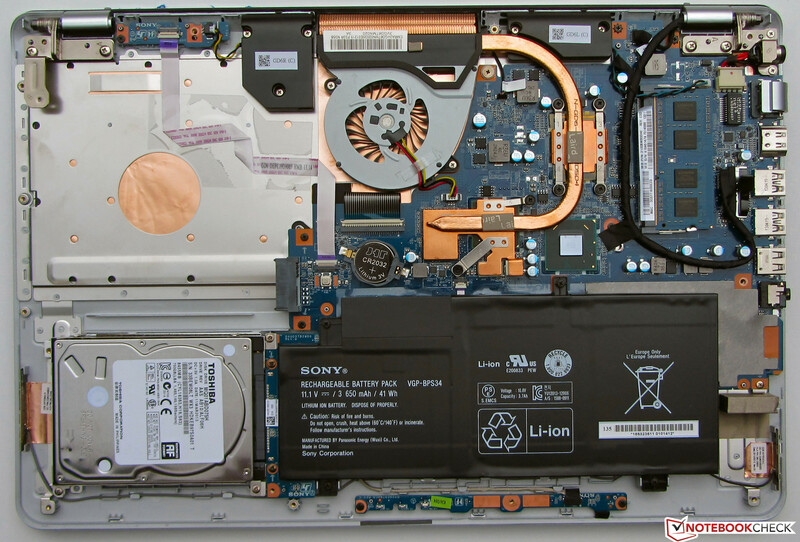 Sony installs an Intel Core i7-3537U processor in our review sample. 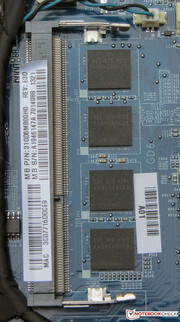 This dual-core is a member of the Ivy Bridge processor generation. Its default clock is 2 GHz and can be increased to 2.9 GHz on both cores and 3.1 GHz on one core via Turbo. The CPU is a ULV processor, i.e. it runs on a low voltage and its power consumption is low. Intel specifies the Core i7 with a TDP of 17 watts. 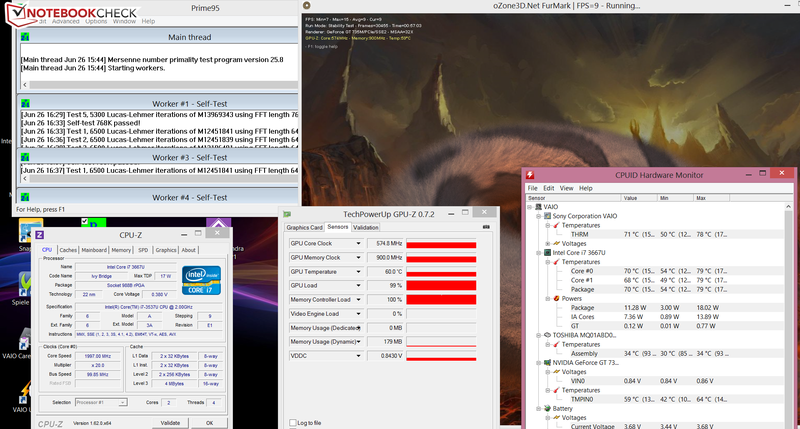 The CPU processes the single thread tests of the Cinebench benchmark at 2.9 GHz. It is rare that a core is boosted to 3.1 GHz. The processor also mostly runs through the multi-thread tests at 2.9 GHz. The cores are recurrently slowed down to 2.4 to 2.8 GHz. 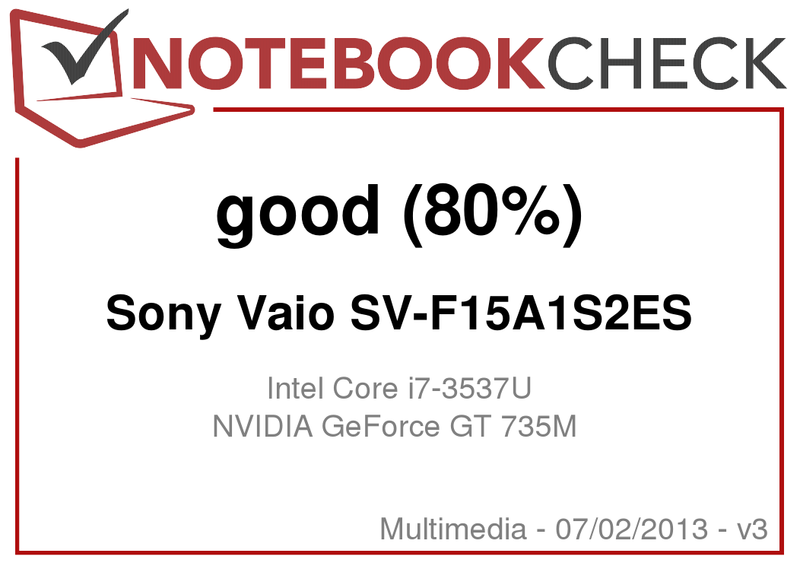 The scores from the VivoBook (Core i5-3317U, GeForce GT 635M) and Aspire (Core i5-3337U, GeForce GT 730M) are behind those of the Vaio in the CPU tests. This is not surprising because the Core i7 in the Vaio runs with a higher Turbo speed and also has a larger level 3 cache. The Vaio wins the GL tests. It sports the strongest GPU. The hard drive's scores in the PCMark benchmarks as well as the transfer rates are good. The specs indicate a swiftly working laptop. The subjective impression contradicts this. Only booting Windows 8 takes a long time. Also, opening programs often seems sluggish. We cannot say whether this is due to the hard drive or the operating system. 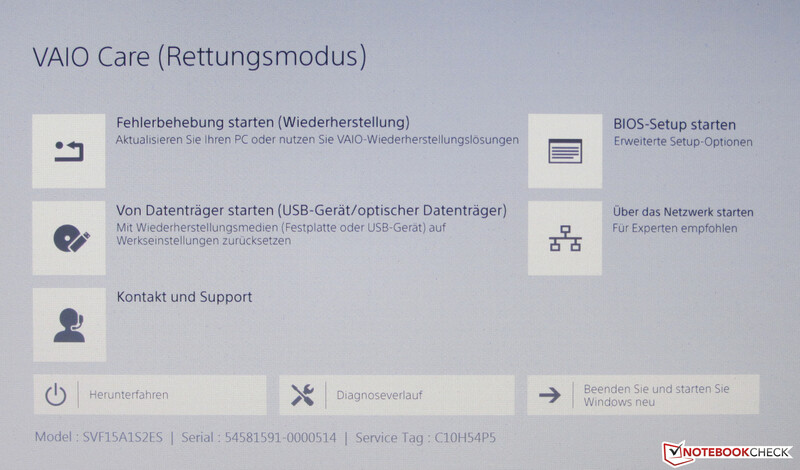 We installed an older Crucial Real SSD C300, 64 GB solid state drive and installed Windows 8 for testing purposes. The system ran fast and smooth right away. As said, the PCMark scores are good. The VivoBook (Core i5-3317U, GeForce GT 635M) is defeated. The Aspire (Core i5-3337U, GeForce GT 730M) achieves better scores as it features a swift SSD. We ran both PCMark benchmarks after installing the SSD and Windows 8 in the Vaio. The PCMark 7 score increased by almost 17% to 4749 points. The PCMark Vantage score even improved by approx. 69% to 13184 points. These scores should improve even more by using a newer solid state drive (e.g. Samsung SSD 840). Sony uses a hybrid hard drive from Toshiba in its Vaio. 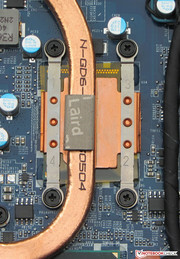 Hybrid means that an SSD cache is additionally integrated in the hard drive. 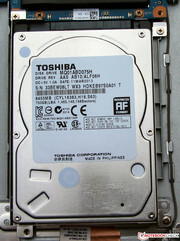 In the case of Toshiba's hard drive, it has a capacity of 8 GB. The SSD is a buffer for write and read access and increases the drive's write and read speed. 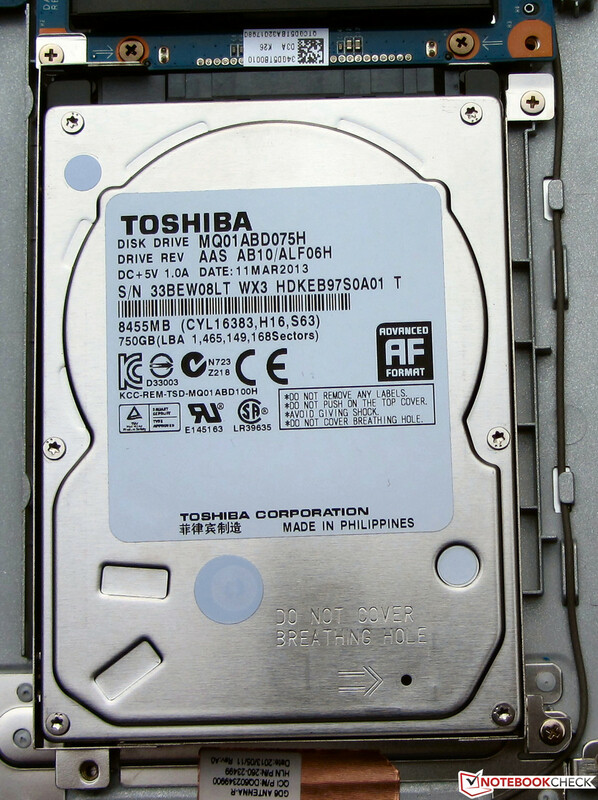 The actual hard drive features a capacity of 750 GB and rotates with 5400 revolutions per minute. The hybrid hard drive works quite swiftly. CrystalDiskMark recorded a read speed of 146.3 MB/s. This rate is good but not exceptional. We have measured much faster transfer rates in other laptops with a combination of a conventional hard drive and separate SSD cache, for example 224.7 MB/s in HP's Pavilion Sleekbook 15-b004sg. Both Intel's HD Graphics 4000 GPU and the GeForce GT 735M graphics core take care of video output. 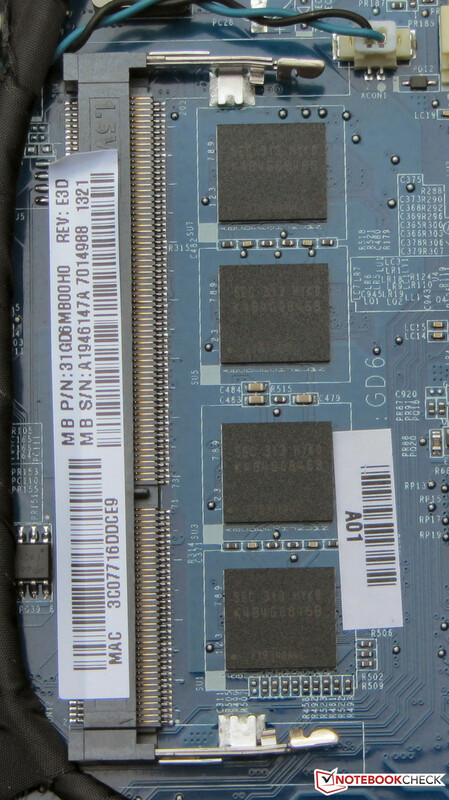 Intel's grapihcs core is usually used for routine tasks and in battery mode. The GeForce GPU is always enabled in high graphics demand, for example when rendering 3D computer games. 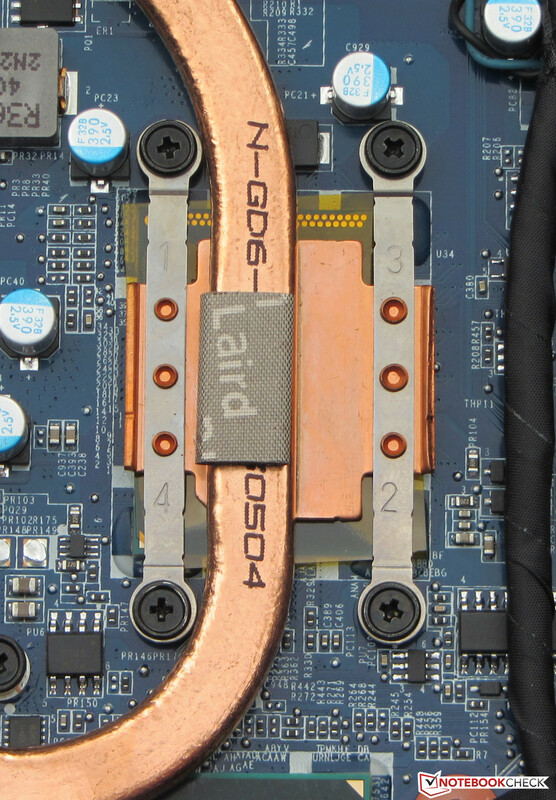 The GT 735M is a member of the GPU midrange. According to GPU-Z, the edition installed in our review sample runs with a default clock of 575 MHz, which we also measured during our stress test using Prime95 and Furmark simultaneously. The speed can be increased to 941 MHz, which is achieved when only Furmark is performed. The Vaio scores lower than the Aspire (Core i5-3337U, GeForce GT 730M) in the 3DMark benchmarks, although the Vaio sports a marginally better graphics chip. The main difference between the GT 730M and GT 735M is their speed. The GT 735M is faster than the GT 730M. However, Sony has set the graphics core's default speed much lower than specified by Nvidia. Consequently, the default clock of the GT 735M core is lower than that of the GT 730M core in the Aspire. 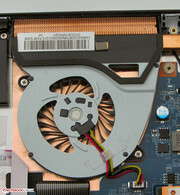 The Vaio is also much more conservative with the GPU's Turbo. The reason for this is likely the laptop's cooling system in both cases. The CPU and GPU cannot work at full speed at the same time and thus the benchmark scores are lower than those of the Aspire. The results from VivoBook (Core i5-3317U, GeForce GT 635M) clearly lag behind its contenders. The Vaio's hardware configuration allows rendering most up to date 3D games using medium quality in the default resolution of 1366x768 pixels smoothly. Many games still run smoothly even in high quality settings. Only a few, undemanding games, like editions from the FIFA series, run smoothly in maximum quality and the Full HD resolution of 1920x1080. Basically, the laptop does not use its full potential. The combination of a Core i7 and GeForce could supply higher frame rates. However, the components cannot run simultaneously at full speed for cooling reasons. We recorded the CPU and GPU speed in the Sleeping Dogs benchmark using Full HD and maximum quality. The test ran for approximately 10 minutes in the selected settings. The CPU ran with 800 MHz for the first 7 minutes and then with 2 GHz. The GPU ran with 941 MHz from the outset. Users with priority on computer games will find much more suitable laptops for below 1000 Euros (~$1287). For example, the entry-level version of the One K56-3F (15.6-inch) with a GeForce GT 750M GPU is available for prices starting at 800 Euros (~$1030). Acer's Aspire V3-771G (Core i7-3630QM, GeForce GT 650M, Full HD screen) is worth considering in the 17-inch sector. It is available for almost exactly 1000 Euros (~$1287). It pays off that Sony installs a ULV processor. The Vaio runs relatively quietly in idle mode. We measured a noise level of 31.5 dB. The VivoBook can undercut this rate with 30.3 to 30.9 dB. We ascertained higher rates of 31.7 to 34.8 dB in the Aspire. All three laptops exceed 40 dB during medium load via 3DMark06 and full load during the stress test using Prime95 and Furmark. This is not surprising since all devices feature a thin casing and a gaming capable graphics chip. Intense cooling is required in tight spaces and it gets loud. The Vaio reached rates from 43.5 to 45 dB, which is higher than the Aspire's 41.2 and 41.4 dB or the VivoBook's 40.6 and 42.4 dB. We measured temperatures ranging from 28.3 and 35.3 °C on the case during idle mode. These temperatures are acceptable. 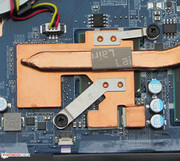 The temperatures of the VivoBook (25.6 to 34.1 °C) and the Aspire (25.2 to 33.9 °C) are a bit lower. The Vaio's temperature slightly increases to 27.2 to 43.6 °C during full load. 40 °C is surpassed in the vent's area. The casings of both the VivoBook and Aspire get much warmer. We measured over 50 °C in some areas. The stress test via simultaneous Prime 95 and Furmark for at least one hour ran on the CPU with 2.7 to 2.8 GHz for the first five minutes in AC mode. One core is repeatedly slowed down to 2.2 GHz. After that, the CPU ran permanently with 2 GHz. That is the case from the offset in battery mode. The GPU ran with 575 MHz in both AC and battery mode. Both components remained below their potential. 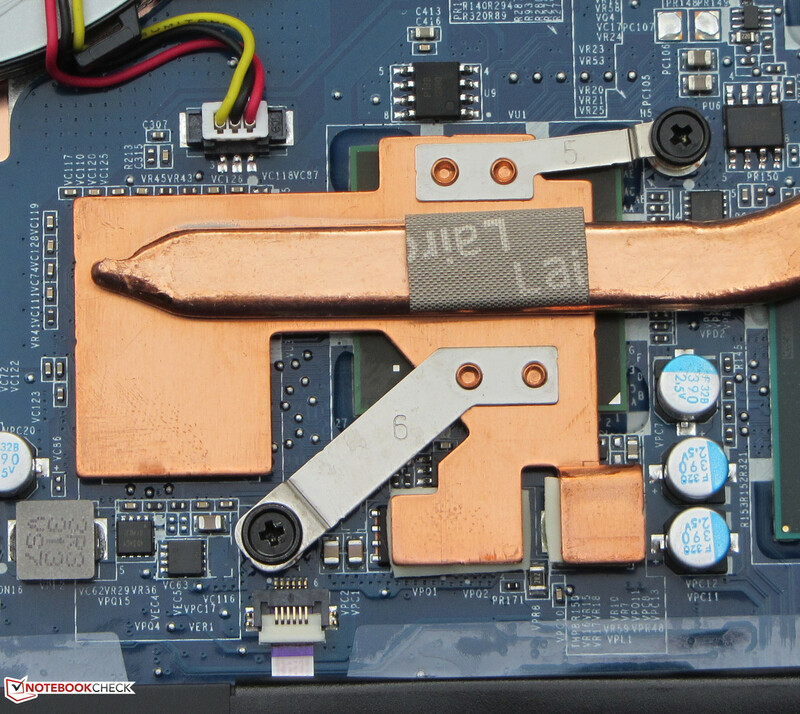 The laptop's cooling system seems to be insufficient for allowing both computing cores to run at full speed. The components only achieved their maximum clock when working separately. We reran the 3DMark06 benchmark immediately after the stress test. The score of 7348 points (CPU: 2541 points) was much lower than in the laptop's cold state (8924; CPU: 3645 points). The CPU's temperature settled to roughly 70 °C in AC mode. (±) In idle usage, the average temperature for the upper side is 32.4 °C / 90 F, compared to the device average of 30.9 °C / 88 F.
The Vaio's stereo speakers are located on the base unit's rear edge. They produce an acceptable sound without bass. The sound gets very tinny when the volume is turned up to max. This is much less intense in lower volumes. Connecting headphones or external speakers is advisable for a better sound experience. The Vaio's idle power consumption of 9.8 to 15.7 watts is rather high. This becomes more than evident when directly compared with the Aspire (6 to 7.7 watts) and the VivoBook (7.9 to 10.2 watts). The energy requirement of the processors and graphics cores in all three laptops is quite similar so that this is not the reason. The most striking difference between the devices is found in the screen. The Vaio screen has a higher resolution and is much brighter than the screens of its contenders. The Vaio's power consumption climbs to 49.7 during medium load via 3DMark06 and 47.4 watts in full load during the stress test via Prime95 and Furmark. The full load rate is lower because the CPU and GPU do not run at full speed. The Aspire (56.5 and 67.4 watts) and the VivoBook (57 and 64 watts) consume more power than the Vaio in both cases. The Vaio shuts down after 5:19 h of idle use. The VivoBook (4:20 h) turns off an hour earlier. Neither laptop can compete with the Aspire (7:35 h). The idle runtime is ascertained using Battery Eater's Reader's test with minimum brightness, enabled energy saving mode and disabled wireless modules. Sony's laptop lasts for 1:20 h in load. The VivoBook (1:29 h) has a slight lead and the Aspire (2:16 h) again clearly surpasses both. The load runtime is determined via Battery Eater's Classic test with maximum brightness, high-performance mode and enabled wireless modules. The Vaio finished the Wi-Fi test after 3:01 h. The VivoBook lasts for almost forty minutes longer (3:39 h). Again, the Aspire leaves both contenders behind with 6:17 h. Websites are opened automatically every 40 seconds in the Wi-Fi test, the energy saving profile is enabled and the screen's brightness is set to approximately 150 cd/m². The Vaio plays DVDs for 2:13 h. The VivoBook (1:44 h) doesn't even last for two hours and the Aspire manages a whole 3:55 hours. The DVD test is performed using enabled energy saving mode or a higher profile should the DVD not run smoothly, maximum screen brightness and disabled wireless modules. The Aspire manages the longest runtimes because it has the highest battery capacity (54 Wh) and excels with the lowest idle power consumption. The batteries in the Vaio (41 Wh) and VivoBook (44 Wh) have a much lower capacity. 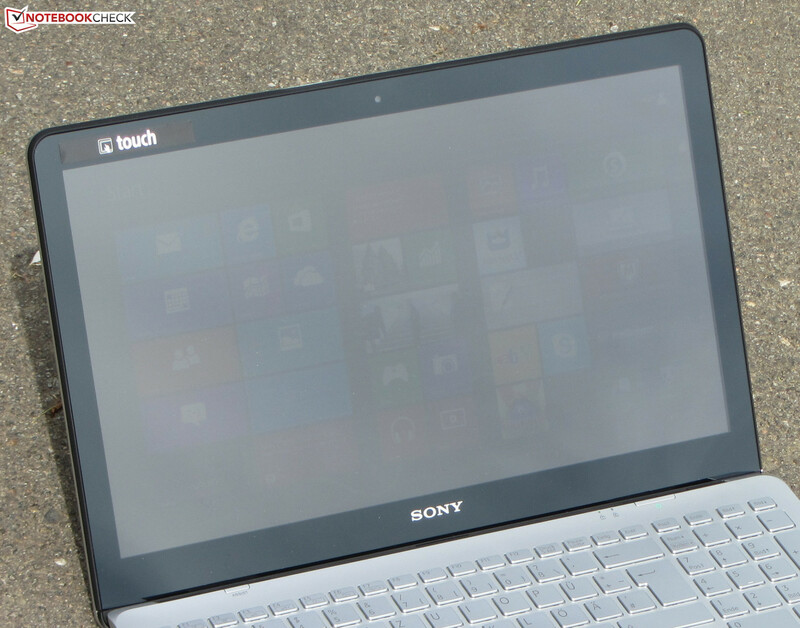 Sony demands a steep price for its laptop at around 1000 Euros (~$1287). We would have expected better battery runtimes and a larger battery for this. Sony's Vaio SV-F15A1S2ES comes with a decent application performance and acceptable gaming power. Beyond that, it comes with a viable, high-definition screen and an agreeable keyboard. It also offers a lot of storage capacity. The battery runtimes are not particularly good due to the battery's relatively low capacity. We would have expected a lot more from a 1000 Euros (~$1287) laptop here. The hard drive is not the fastest of its kind either. 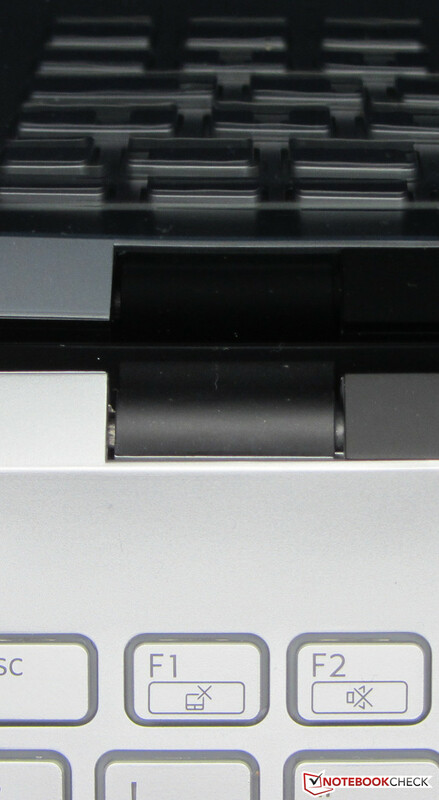 We have seen swifter SSD-HDD combinations in much lower-priced laptops. Asus' VivoBook S550CM-CJ038H (approx. 800 Euros, ~$1030) and Acer's Aspire TimelineU M3-581PTG (approx. 900 Euros, ~$1159) generally offer the same range of functions as the Vaio but cost less. However, compromises have to be made with the CPU and GPU and their screens have a lower resolution. 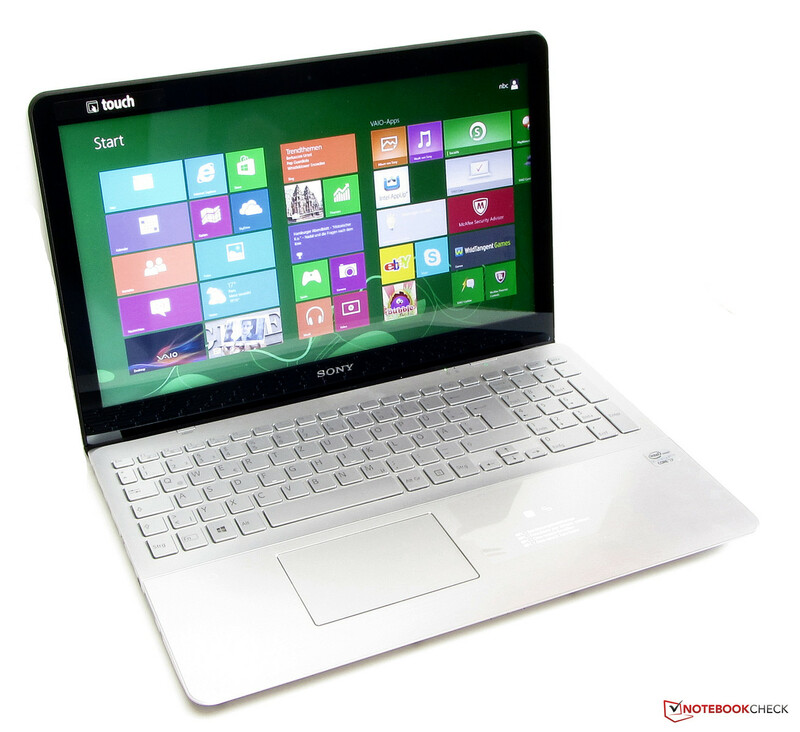 The Aspire is superior to the Vaio in some areas despite its lower price. For example, it sports a solid state drive and achieves much better battery runtimes. Accessing the innards is possible after removing the casing's bottom. Only one working memory bank is available. 4 GB of working memory is soldered to the motherboard. It would be possible to easily replace the hard drive. and graphics core are soldered. The BIOS battery can also be accessed. Sony installs the Wi-Fi antennas in the base unit. The battery weighs 217 grams and can be removed. It is secured by four screws. It supplies a capacity of 41 Wh. 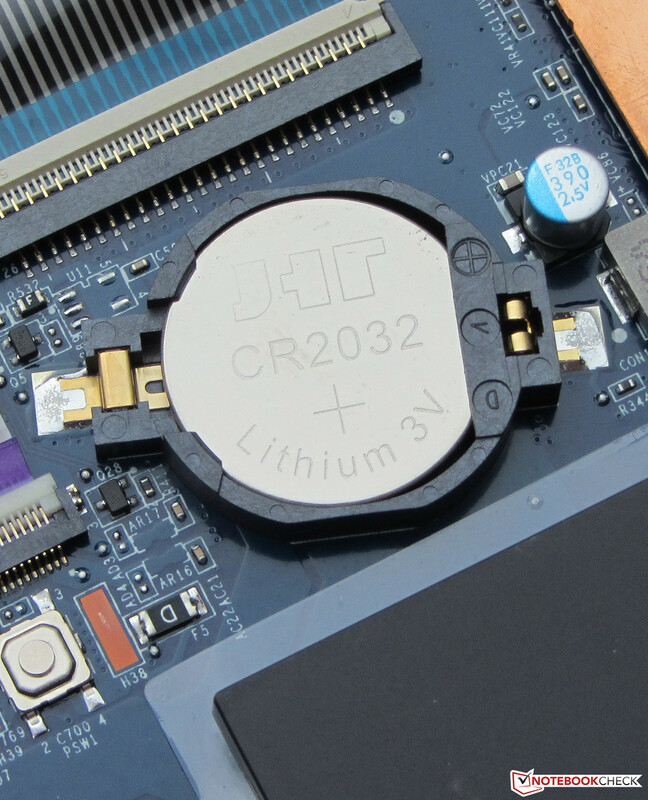 connects the battery with the motherboard. The lid also serves as a footrest. The rubber feet protect the lid from scratching. The hinges keep the lid securely in position. Pressing the "Assist" button when the laptop is off.. The good screen and decent application performance. 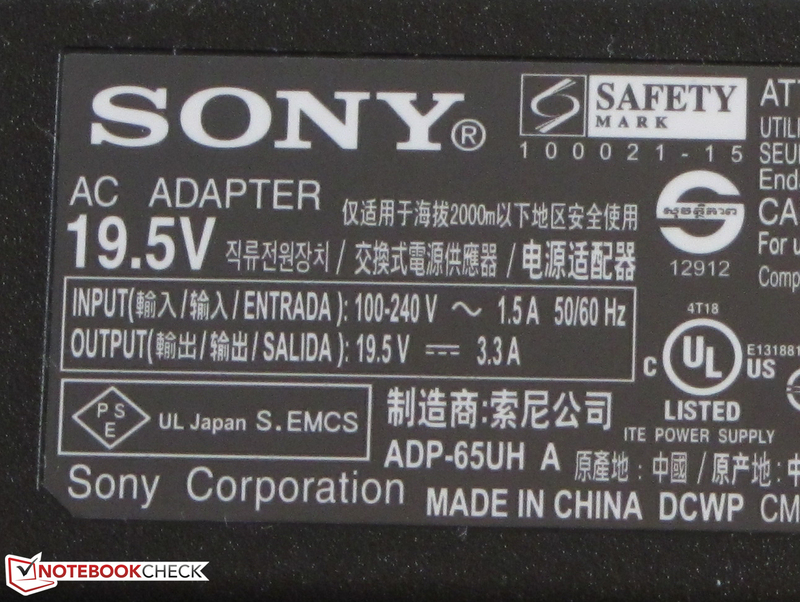 Sony installs a relatively low-capacity battery in a 1000 Euros (~$1287) laptop and thus does not achieve awe-inspiring battery runtimes. Asus VivoBook S550CM-CJ038H, Acer Aspire TimelineU M3-581PTG, Schenker Xirios B502, HP Spectre XT TouchSmart 15-4000eg, Lenovo IdeaPad Z500, Samsung Series 7 Chronos 770Z5E-S01DE, Sony Vaio SV-T1511M1E/S, HP Pavilion Sleekbook TouchSmart 15-b153sg.